In the history of distance running, Ron Clarke is undeniably one of the giants. And this is remarkable because every account of his competitive career relates that he never won a major championship. Indeed, he seems to have been the role player in the famous moments of other runners. When Billy Mills won Olympic Gold in Tokyo in 1964, it was at the expense of Clarke who had pushed the pace from early on but ended up with bronze as Mills flew to victory. When John Landy cemented his reputation as one of the finest sportsmen in Track and Field by helping a fallen runner in a mile race, that runner was Clarke. It was to Clarke that the immortal Emil Zatopek gifted his Olympic 10K Gold Medal won in the 1952 Games, saying that Clarke deserved it. There was something about the way Clarke approached running that earned him immense respect among runners, even if his lack of championship victories led some to call him a loser during his career. In a quote I can no longer find or remember exactly, he responded to his critics by saying that the only real tragedy was when fear of losing kept young athletes from even trying. Ron Clarke was someone who redefined what trying meant. As Len Johnson wrote, he raced often and always hard. In the 1964 Olympics, he competed in the 5000, 10,000, and marathon. He repeated that feat in the 1966 Commonwealth Games. In 1965 and 1966 he set numerous world records in distances from 2 miles to 20,000 meters. 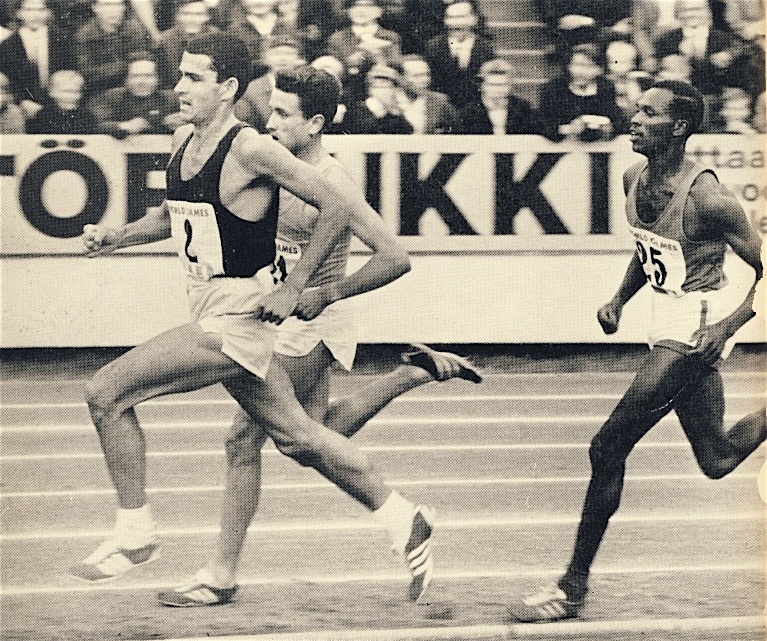 On July 14th, 1965, he ran what might be the most remarkable 10,000m in history at Bislett stadium in Oslo, Norway. Without rabbits or challengers for most of the race, Clarke lowered his own world record by an astonishing 36 seconds, from 28:15.6 to 27:39.4. It was and is the largest improvement in the 10K record ever recorded, and he did it virtually alone. That record was part of a remarkable summer in which he set 12 world record in a span of 44 days. In the 1968 Olympics in Mexico City, Clarke again failed to medal. He finished sixth in the 10,000m, a race in which he is said to have almost died from altitude sickness (he always said he didn’t remember anything of the last lap, and collapsed after the race). Nevertheless, he competed in the 5000m later in the games. Some will always see Clarke as a breaker of records, not a winner or races. But I think his lasting legacy will be that he was a runner of races, a man who gave his all every time he stepped on the track. In that pursuit, he had few equals. I still enjoy reading articles on ron Clarke and so- happened upon your great defense of him here. ron ran primarily for fitness and then for competition. he was not particularly interested in setting records- they just occurred at times of his fitness peaks. this explains why he always set records in clusters during 1965 and to some extent in 66-67. incidentally rons fitness peaks had nothing to do with reaching a peak for a certain race which he never really attempted. if he had- his records would have been even greater. as you may know-rons greatest strength was the 10000 meter run- but nobody could compete with him- thus he spent most of his career racing the 5000 meters/3 mile even to his detriment-simply to enjoy competition. ron really wasn’t motivated to win so much as pushing the pace against runners he thought were faster in the sprint finish. if winning mattered to ron primarily- he would have stuck primarily to the 10000 meter races and run everyone right off the track. rons epic race- the record 10k in oslo 65 was 27:39 as you pointed out. what you may not know is that during lap 18-ron developed a bad side ache and lost many seconds at that point. he also ran many laps sometimes in lanes 2 and 3 due to to the cut up track. he obviously would have broken 27:30 that day otherwise. if ron really concentrated on the 10k his whole career he could have approached 4:25 per mile pace on dirt equating to around 4:21 per mile on synthetic leading to possible breaking of the 27:00 barrier. if he had- his ill informed critics would have been silenced forever. if you happen to read my thoughts- write me back and we could continue a dialogue on guys like Clarke, snell, lindgren.